It is one of the most popular desserts in Los Angeles and many coffee shops closely guard their banana cream pie recipe. Banana custard pie is a simple pie to put together. It is part of the comfort food group and you will find it in most coffee shops and picnics. It shows up at picnics and family gatherings because it is a fast, tasty no-bake pie. At its most basic, a banana cream pie recipe is simply pastry cream with bananas layered in the middle. This is a nice pie and would be welcome at any gathering. But, if you are going to go through the trouble of making a pie from scratch, why settle for nice? What we are going to do is take the basic banana cream pie recipe and make it a little more upscale. If you can heat milk, you can make a pastry cream. I wanted a richer pie filling so I used a deluxe pastry cream. This is a pastry cream with more egg yolks rather than whole eggs. I broke the recipe down into three parts. The crust is same as I used for the Caramelized banana pie, the filling is going to be a combination of pastry cream and a special whipped cream with Crème Fraiche, and, of course, the bananas. I added the Crème Fraiche because I wanted a slightly sharper flavor to the filling and a richer texture. As with any no-bake pie, we need to do a little baking. Although the filling is deluxe pastry cream and is cooked before we put it into the pie shell, we do need to bake the pie shell. Use any piecrust recipe you like from any source you prefer. You will need to blind bake the crust. Once the crust is golden brown and ready to go, the next step is the pastry cream. In a saucepan, mix the sugar and milk and bring the milk to just a boil. In a heatproof bowl, whisk the yolk. Sift the starch and remaining sugar into the yolks and whisk until smooth. Temper the yolk mixture by slowly adding a small amount of the hot milk in a thick stream to the yolk while whisking. Then, slowly add the yolk to the milk. Bring the mixture to a boil while whisking. When the cream comes to a boil and becomes thick, remove from the heat. Stir in the butter and the vanilla extract. Cover with plastic wrap, making sure the plastic is touching the surface of the cream. 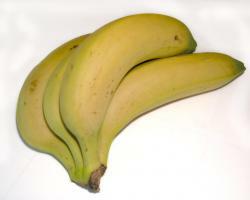 Slice one banana into lengthwise strips about a quarter of an inch thick. Place on the bottom of the pie shell in one layer. Dice the rest of the bananas. Place the diced bananas into a bowl and coat with orange juice. To make topping, simply whip to stiff peaks. Fold one cup of the topping into the pastry cream. Fold the diced bananas into the pastry cream. Fill the piecrust with the filling. Cover the pie with the remaining topping. If you happen to have some topping left over, you can pipe some rosettes around the border. Decorate with the banana rounds. If you want to take this pie over the top, you can take a little chocolate sauce and drizzle it over your pie.